Every two years, IUPAC holds a General Assembly (GA) for governance meetings of its Council and Bureau, and for all division and standing committees and other bodies. Since 1997, the GAs have been held in the same city as the biennial scientific Congress. This year the GA and Congress were held from 8–17 August in Ottawa, Canada. This was only the second time that the meetings were held concurrently—the first was in 2001 in Brisbane. An intense and intricate schedule of various committee meetings took place over 10 days with the Congress itself basically scheduled in the middle of that period. The last meeting to take place was that of the Council, the highest governing body of IUPAC, composed of delegates from the member countries. As IUPAC President Piet Steyn remarks in his column on page 2, both the GA and the Congress are major events for IUPAC. CI asked IUPAC executive director John Jost and the Congress president Alex McAuley to highlight the major developments that took place in Ottawa. With an agenda as thick as a phone book, the 25 or so members of the Bureau met for a day and a half during the GA. The 42nd General Assembly brought 340 registered participants to Ottawa, Canada, in August. 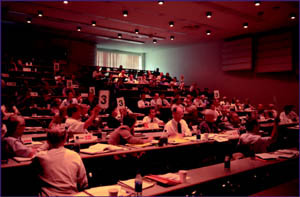 Although this was the first GA following the restructuring that discontinued most commissions, several task groups, subcommittees, and working parties also arranged meetings during the GA.
With the financial support of IUPAC, 145 GA participants also registered as regular attendees at the Congress. Although the GA schedule is packed with meetings every day, not all members are required to participate in all meetings. The intercalation of the Congress in the schedule of the GA is planned so that GA attendees can, in theory, participate in some of the numerous scientific sessions offered by the Congress. Some delegates (representatives of the National Adhering Organizations [NAOs] and Associate NAOs) who were only convened for the Council meeting 16–17 August arrived earlier and also attended the Congress. With various sources of financial support, 25 Young Observers participated in meetings of the GA and also attended the Congress. This year, the Young Observers program was expanded to include Australia, Brazil, France, Germany, India, New Zealand, and Puerto Rico so that one Young Observer from each country was able to also attend the GA. From countries that have their own program, nine young observers came from the USA, five from the UK, three from Japan, and one from Canada. At a Welcome Reception on Saturday 9 August, IUPAC President Pieter Steyn addressed the GA participants and took the opportunity to review some of the major accomplishments of the Union in the current biennium. Highlights of the evening were the introduction of the nine IUPAC Prize Winners and the presentation of service recognition awards to the retiring division past presidents, division presidents, and standing committee chairmen. The IUPAC Prize Winners received their plaques (and checks) at the official Opening Ceremony of the Congress the following day. The President also acknowledged the generous gift of USD 125 000 made by the Samsung Chemical Corporation to the Macromolecular Division. Prof. Jung-il Jin, vice president of the Macromolecular Division accepted a plaque on behalf of Samsung in recognition of this grant (in print p. 15). "The Council adopted a proposal of the Governance Structure Committee to establish an ad hoc Union Advisory Committee." While the week continued with various committee meetings and the Bureau meeting, an amazing event took place on 14 August: a gigantic blackout left the entire province of Ontario, as well as a number of states in the northeastern USA, without electricity. The failure of the electrical grid continued for a few days, but luckily the University of Ottawa, the site of the GA, had sufficient emergency power to allow meetings to continue on Thursday and Friday. By Saturday, power was slowly restored to most of the campus and large parts of the city of Ottawa. On 15 August, over 50 participants, including the presidents of many chemical societies, attended the World Chemistry Leadership Meeting (WCLM). The WCLM assembles the presidents of national chemical societies, regional chemical federations, and leaders of chemical industry to discuss subjects of importance to the global chemistry community. A report on the WCLM will appear in a future issue of CI. The Council met on 16 and 17 August. One function of the Council is to elect the officers and elected members of the Bureau. The Council elected Bryan Henry as vice president. Professor of Chemistry at the Department of Chemistry and Biochemistry at the University of Guelph in Ontario, Canada, B. Henry will become IUPAC president in 2005. He served as Scientific Program chair of this year’s IUPAC Congress, and since 1998, as chair of the Canadian National Committee for IUPAC. His accomplishments also include serving as chair of the Committee of Chemistry, Department Chairs of Ontario Universities (1990–1993), vice president (1991–1992) and president (1992–1993) of the Canadian Society for Chemistry (CSC), and vice chair (1996–1997) and chair (1997–1998) of the Chemical Institute of Canada (CIC). The elections of the officers and elected members of the Bureau is one function of the Council. This year, the Council elected David StC. Black of Australia as secretary general and reelected Christoph F. Buxtorf of Switzerland as treasurer. Leiv K. Sydnes of Norway succeeds to the presidency on 1 January 2004. Werner Klein of Germany, retiring president of the Chemistry and the Environment Division, and Anders Kallner of Sweden, retiring president of the Chemistry and Human Health Division, were elected to the Bureau. Nicole J. Moreau of France and Oleg M. Nefedov of Russia were reelected to the Bureau. The IUPAC Council in session. The Council adopted a proposal of the Governance Structure Committee (GSC) to establish an ad hoc Union Advisory Committee (UAC). 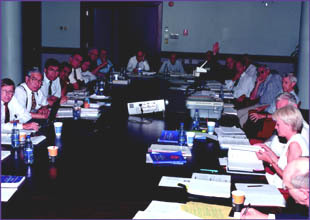 The GSC, chaired by Leiv Sydnes, was established to analyze the strengths and weaknesses of the current structure and operation of the Bureau, including its Executive Committee. The UAC, comprised of one representative from each NAO, will meet only at the GA and will be consulted between meetings by the Executive Committee on policy matters. This new body should greatly improve two-way communications between IUPAC and its NAOs. The UAC will operate primarily by e-mail but is expected to meet at the next GA in Beijing in 2005. Other GSC proposals, such as the idea of replacing the Bureau and Executive Committee with an Executive Board—to consist of the five officers plus four members elected by the Council—were not adopted at the GA and were deferred for further study. Additionally, a Bureau proposal to bill national subscriptions in national currencies was overwhelmingly adopted by the Council. This change will allow NAOs to pay in USD at the then-applicable exchange rate, insulating them from currency fluctuations. The Council approved the motion for a proposal presented by the UK delegation for IUPAC to set up a task force to tackle the problem of the declining numbers of young people being attracted into chemistry. It was proposed that the task force first define the extent of the problem at the international level and then approach chemical industry to raise funds for enhancing the importance of chemistry education. Other major decisions by Council included approval of the application of the Italian NAO to hold the 44th General Assembly and 41st Congress in Torino in August 2007. Council approved the application of the Bangladesh Chemical Society to become the forty-fifth IUPAC NAO and approved the Chemical Society of Mauritius at the Associate NAO status. As announced in the September issue of CI, the Council approved the name and symbol for element of atomic number 110—darmstadtium, Ds. Highlights of the decisions made by the Council and the Bureau can be found on the IUPAC Web site, in the News section. Minutes of the committee meetings will be posted in due course.